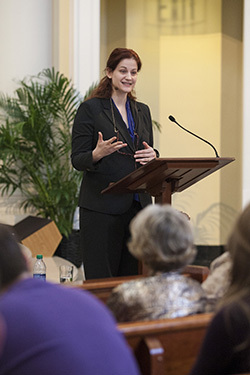 John Calvin has sometimes been characterized as "the theologian of No," said Dr. Karen Petersen Finch in lectures at Samford University's Beeson Divinity School. The Whitworth University theology professor sought to reclaim Calvin from that negative stereotype. "Calvin is the most caricatured of all theologians," said Dr. Finch, delivering Beeson's 24th annual Reformation Heritage Lectures. Speaking on the topic "John Calvin, 'Postmodernism' and Power," she argued that, as a Christocentric thinker, Calvin was a theologian of abundance. Humility is a central theme in Calvin's writing, according to Finch. She argued that Calvin's emphasis on the death of pride and the necessity of humility is, paradoxically, empowering. Finch summarized Paul's message to the Corinthians on the same theme: "Stop making claims for yourself so that you can reach out and claim what you have in Christ, riches that you did not create and you do not deserve. Empty your hands that God in Christ might fill them." Finch spoke pastorally, drawing on Calvin and the Apostle Paul to warn divinity students of the hidden perils of pride. "In causing us to claim too much, pride causes us to claim too little," she said. "...Because we believe that our hands are full, we walk away from Christ's bounty empty-handed." On a personal note, Finch also brought greetings to Samford from Dr. Beck Taylor, the former dean of the University's Brock School of Business who serves now as president of Whitworth. Finch is an ordained minister in the Presbyterian Church (USA).